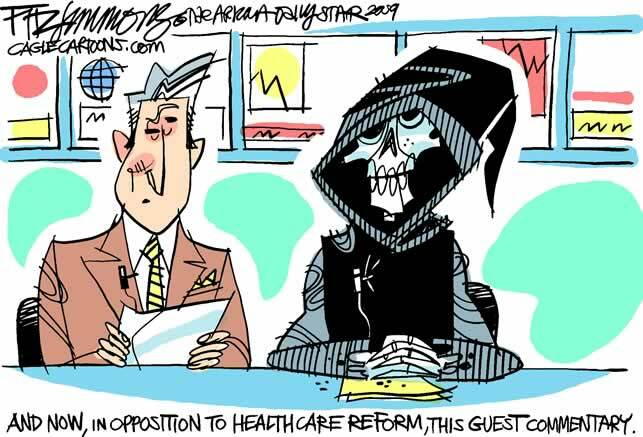 A Ipsos poll was recently released stating that 56% of all Americans are opposed to the Health Care Reform, but, paradoxically, most people strongly favor the provisions of that law. In fact, the majority of people like everything except the individual mandate: they like the coverage for pre-existing conditions; the exchanges; the prescription drug relief; the ability to keep children on their parent's health care plan until age 26; even 72% of people like requiring companies with more than 50 employees provide health insurance. And yet, 61% of all people oppose the mandate. This is yet another case of people in this country wanting their cake and still being able to eat it as well. It is a chronic problem in this nation; people who want all of the benefits, without having to share any of the pain. We want tax cuts, but don't want any hits to services. We demand cheap goods, but we don't like sending manufacturing to China. We hate the deficit, but refuse to take any meaningful action to fix it. The problem is, with the health care bill, the mandate is not severable. I'm not talking about legally, the Supreme Court may find that they can chop out that one part and leave the rest intact. What I'm talking about is the economic reality that the mandate makes everything else possible. Let me explain. For this example, I'll use the pre-existing condition ban, which is actually one of the most popular and necessary aspects of the law. The harsh reality is that people with a pre-existing condition are going to cost the insurance company more than a healthy person. They are ill, and that illness will require medical treatment, which in turn will cost money. In fact, it will cost more money than they pay in through their premiums; if it didn't the people wouldn't need or want insurance coverage. So in the end, these people cost the company money, but that's the way insurance works. It is essentially a gamble that the company will take in more money than it pays out. But unlike a casino, they have to pay out on policies, they are not allowed to do what casinos do and limit payouts to a percentage of what they take in. Therefore, when there is a disaster, companies are on the hook for far more than people have paid in. With health insurance, the idea is that the healthy people who don't need medical care fund the sick. This is how the financial equation balances out. But without the mandate, insurance companies will see a flood of medically needy people signing up and will, by law, not be able to turn them away. In the end, there will not be enough low cost customers to cover the expenses of the high cost people. Many of the other provisions will also add to this, but not necessarily as drastically as the ban on pre-existing conditions. So in the end, without the mandate, there is no way to fund the rest of the law. With a "free market," for profit insurance industry, the companies need the massive influx of healthy people to balance the costs out and remain profitable. Without that income, health insurance companies will collapse under the immense weight of being required to insure people who are medically expensive, while not being given the ability to force healthy people into the system. If they sever the mandate and leave the rest untouched, this will collapse the insurance companies and Congress will have to act, either to strike the rest of the law, or create some new mechanism to make it work. If they strike the entire law down, health care costs will continue to soar, more people will not get treated, and again Congress will have to act. This leads, ultimately, to four scenarios for health care in this country. I will address each in turn. The first is the "you're on your own" scenario. In this future, people will be on their own for health care; insurance will become a luxury commodity, only able to be affordable for the wealthy. In this concept, the government will play no role in health care, and will have no way to contain health care costs. As a consequence, more and more people, especially the medically needy, will be forced to seek health care through the emergency room, which will force hospitals, not insurance companies, to bear the brunt of the costs of their care. This will ultimately force health care providers into bankruptcy or will force laws to be passed allowing for the denial of care based on ability to pay. In this future, we are looking at a very real likelihood of healthcare in America resembling that of places like Haiti, the rich get treated, the poor die. Since that is probably an unacceptable situation in the United States, we will turn to the second option which is health care returns to a charitable enterprise. For most of the history of our country, religious and quasi-religious institutions administered health care in this country. You can see this in the names of hospitals, Saint Joseph's, Presbyterian, Lutheran. They were named for the denominations that ran them. Similarly, most health insurance companies were non-profit. I remember when Blue Cross and Blue Shield were 501 (c) (4) corporations, which means they were classified as social welfare. They did not change to for profit until the tax reform of 1986 reclassified them, and in 1994, they became for profit institutions. If health care returned to the hands of non-profits, they would have the backing of charitable donations and foundations. A still functioning example of this is the Shrine Hospital system, which is funded by Freemasons and Shriners across the country. Children in these hospitals do not pay a penny for their medical care. A health care system administered by charities would not be expected to turn a profit, and since there would be no profit in the system, there would be no incentives to inflate the costs of care. By removing the profit motive, you would control costs. However, this is also not a realistic solution. Non-profits cannot compete in a for profit system; they can't attract the most skilled professionals or afford to keep up with the state of the art technologies. The system is gamed against them, and the for-profits would not ever let them play on a level field. The third option would be to keep the Obama health care plan's individual mandate. While this will not control costs directly, it does create a large enough pool of healthy people to counterbalance the costs of the not healthy patients. However, if the Supreme Court strikes the individual mandate, in whole or in part, this would require a constitutional amendment to impose. Getting an amendment through the required number of states is even more unlikely than getting a 2/3's majority in congress, so this idea is dead on arrival. The final scenario is ultimately the most likely, if the Supreme Court strikes down Obama's health reform. Eventually the free market will collapse under it's own weight. We are entering into a healthcare bubble, like the dot com bubble and the housing bubble. Costs are rising far faster than inflation, and this is unsustainable. Couple that with the fact that health care will be 20% of GDP by 2017, compared to manufacturing which is barely 15% and declining. This indicates a high probability of the system popping, like so many of the other bubbles in the last decade. Once the bubble pops, the government will have to step in. Remember the banks and the auto industries that were too big to fail. Health care occupies as much or more of our economy as those sectors, can we really afford to let the health care system go under? And once the system begins to unravel, there will likely be only one solution, single payer. This is how health care is administered in most countries; the government provides the insurance for everyone, spreading out the risk and generating enough revenue to fund the system. And if you think this is un-American, realize that Medicare is a single payer insurance system, and we love our Medicare. Medicare works because, even among seniors, most people need minimal health care, and the ones that do are funded by those who don't. The only real differences are that Medicare has a very low overhead, far lower than any private plan, and it does not have to be profitable. It only has to cover the expenditures. Ultimately, if the Obama health care reform bill fails, we will have to consider the single payer system, and since Medicare is already established and functioning, the best way to do it is to open up Medicare to everyone. This will strengthen Medicare and provide health care for the entire country at a reasonable expenditure. By killing the Obama plan, ultimately, we will have a single payer system, since it is the only realistic solution. By fighting the Health Reform Law, we might get an even better system. As a liberal, I recognize that if we lose the battle, we will ultimately win the war. It makes me feel better to know that in this decision will be sown the seeds of destruction of the for profit health industry.